Arjun Kapoor is all set to get back to work mode. The actor is undergoing prep for the next film Panipat already. Being his first-period drama, Arjun began the process with going bald for the role as Peshwa Sadashiv Rao Bhau in the Ashutosh Gowariker directorial. Now, he has kick-started the year with horse riding lessons. On Friday morning, Arjun Kapoor heading to Mahalaxmi Race Course in Mumbai to get lessons on horse riding. 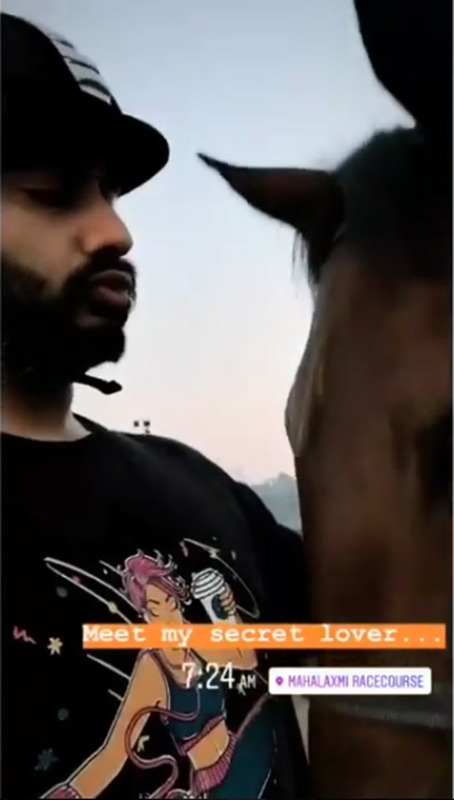 Early in the morning, Arjun shared a video while patting a horse before she started his lessons. It seems like the actor is completely immersing himself to learn everything for this film. He captioned the video, “Meet my secret lover,” while filming the horse. Directed by Ashutosh Gowariker, Kriti Sanon will be essaying the role of Parvati Bai, Arjun Kapoor’s second wife in the film. A huge set of Shanivar Wada has been erected at the studio. Panipat also stars Sanjay Dutt, Shashi Kapoor’s son Kunal Kapoor and Mohnish Behl. Also Read: Arjun Kapoor is handling it all with a gentleman’s élan – Work, Love and Life! Prevअब रेलवे स्टेशन पर पहुंचना होगा ट्रेन से 20 मिनट पहले, नहीं तो….